DesignARC, a Santa Barbara based architecural firm, contacted Vanguard Planning about this project in June 2010. They had been working with the client, Sharon and Tony Purpero, over several years to obtain approvals from the City of Santa Barbara for a large single family residence located on a steeply sloping property in an area of Santa Barbara commonly known as “The Mesa”. The site is just over one acre, and has spectacular views of the Pacific Ocean and Channel Islands. It comprises six lots from the Rogers Tract, an illegal subdivision created between 1929 and the late 1950’s, and is located on a hillside with an average slope of approximately 41%. History of Processing Difficulties: Mike Gones, the civil engineer, and DesignARC briefed Jarrett Gorin in mid-June, and explained that the client had worked with two other planning consultants and a land use attorney during several previous attempts to entitle various projects on the site. The most recent included a request for a lot area modification to allow for approximately 1% less area than the 45,000 square feet required by a Conditional Certificate of Compliance that applies to the property. City staff did not support the modification request, and had brought the project before the Planning Commission for a conceptual review. The conceptual hearing was attended by the City’s Staff Hearing Officer (SHO) as well. The Planning Commission denied the lot area modification request in concept, and during the course of the hearing, made several negative comments about the project, including concerns about its mass, bulk, and scale. Environmental review is not required for a conceptual hearing, and had not been completed by City Staff. As a result, the Planning Commission did not have the benefit of a detailed analysis that would have addressed many of the issues about which the Commissioners expressed concern. 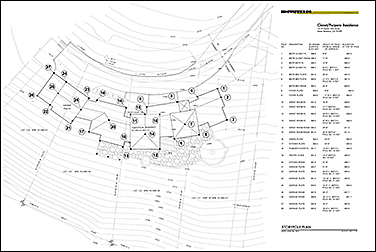 Following the conceptual hearing, the client dropped the requested lot area modification, and combined various lots they owned to create a 47,455 square foot project site. There was no way to provide the standard frontage on a public right-of-way, so a street frontage modification was required. This triggered discretionary review by the SHO. Ordinarily, single family residences are approved by the City’s Single Family Design Board (SFDB). The Purperos engaged Vanguard Planning to obtain their discretionary approval on June 21, 2010. Project Features: The project team had already developed a sound design concept for the proposed residence: locating it on the least-sloped portion of the project site, and cutting it into the hillside to keep grading to an absolute minimum (see site section at left). The structure was also located in proximity to the terminus of Harbor Hills Drive, eliminating the need to construct a long private driveway for access. The residence was designed in a shallow and wide configuration which follows the existing topography, and avoids multi-story “stacking” which could increase its apparent height as experienced from public viewing locations. The structure is 4,217 square feet, and originally included a detached two-car garage, which the clients revised to a 627 square foot three-car garage at Mr. Gorin’s recommendation. Outdoor living area is provided on an large patio accessible from the lower floor. 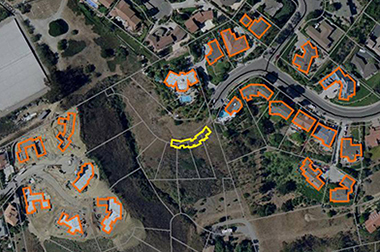 Neighborhood Compatibility Determination: Review of the case history indicated that City staff had concerns about neighborhood compatibility, despite the fact that the proposed residence was within the size range of existing nearby homes and located on one of the largest lots in the vicinity (see building footprint comparison at right). Mr. Gorin believed that a determination of compatibility by the SFDB, as early as possible in the review process, would be helpful to resolve any ambiguity about whether the proposed residence is appropriate for its site and the surrounding neighborhood. Because the proposed residence exceeds 85% of the maximum floor to area ratio on its lot, Mr. Gorin completed a “20 Closest Homes Analysis” to provide hard data for the SFDB to consider during its review. The SFDB evaluated the proposal on August 2, 2010 and recommended a minor revision to the proposed roof plan. On August 30, 2010 the SFDB approved the project in concept, determining that the proposed residence is compatible with the surrounding neighborhood, and further stating “The architecture is exemplary and the breakup into facets provides a sense of village.” The SFDB provided positive comments in support of its finding that the proposed residence was appropriate for its site and the surrounding neighborhood, and sent the proposal forward for final review by the SHO. Consistent with standard City procedure, a formal motion granting conceptual approval was not adopted because the project required final approval by a decision-maker other than the SFDB. Ongoing Disagreement about Neighborhood Compatibility and Grading: Following the SFDB’s review, the assigned case planner continued to raise concerns about neighborhood compatibility, asserting the SFDB’s determination did not indicate that the residence was appropriate for the neighborhood because the board hadn’t adopted a motion granting concept approval. The case planner also stated that the project required too much grading, appearing to overlook the fact that the City had recently approved a large single family residence requiring over twice the proposed grading volume on an adjacent, topographically identical property. At one point, a grading policy from outside the City of Santa Barbara (and therefore not applicable to the project) was cited to support staff’s claim that there should be no grading (and therefore no project) on a slope in excess of 20%. Mr. Gorin became concerned that staff was using an inapplicable policy from an outside agency to justify their position on grading, and excluding recent interpretation of applicable City policies from consideration. A case planner reassignment was requested, and granted in January of 2011. The application for discretionary review was deemed complete by the newly assigned planner on January 28, 2011. Aesthetic/Visual Impacts: The City completed a detailed environmental review over the next several months, revealing that the project would not result in any significant impacts. A public hearing was scheduled for July 27, 2011. In preparation for the hearing, Vanguard Planning designed and managed the installation of story-poles consistent with City requirements (see plan at left). On the afternoon of July 25th, the case planner informed Mr. Gorin that the SHO was concerned about how the proposed residence might appear from locations within Shoreline Park, a critical public viewing location to the South. Line-of-sight distance from the park to the subject property is over one-half mile. As a result, it was nearly impossible to discern the story-pole installation from its background when viewed from the park. The environmental document for the project had already concluded that potential visual impacts, including impacts to views from Shoreline Park, were less than significant. However, it was clear that this issue had to be thorougly addressed at the upcoming hearing. This presented a major challenge: the need to produce a technically accurate visual impact analysis using photographs of story-poles that were not visible with the naked eye. The analysis had to be produced in-house by Vanguard Planning that same evening so that the SHO could review it prior to the hearing. City staff captured the story-pole installation in several zoomed-in photographs, but these did not accurately represent future views of the structure. The human eye has a wide angle of view and no magnification. Staff’s photographs could not be used because the images grossly overstated potential visual impacts. Although the zoomed-in images were not adequate, they provided inspiration for a methodology to create accurate representations of the proposed structure’s mass, bulk, and scale superimposed over images replicating a natural field of view. Mr. Gorin obtained photographs of the project site from eight locations within Shoreline park using a 200mm telephoto lens, and a 50mm wide angle lens. Images using both lenses were precisely aligned by using a tripod to maintain a fixed orientation of the camera body. In each case, the story-pole installation was clearly visible in the telephoto image, and the wide-angle image accurately represented the view from the park. The story-poles were traced with brightly colored lines on the telephoto image, and the “wire frame” was proportionally scaled down to match the wide angle image. Fixed reference points in both images (trees, antennas, etc.) allowed for perfect re-sizing and alignment, resulting in 100% accurate representations of the future views with the proposed residence in place (see PowerPoint slides above). The SHO approved the requested street frontage modification, allowing the project to occur, at the July 27, 2011 hearing. This discretionary approval included adoption of the environmental document and its assessment of visual impacts. The SHO indicated that the photographic analysis of views from Shoreline Park was a primary basis for making the required findings.